John Wesley Woodward had already had a narrow escape whilst on board the Olympic (Captain Edward Smith) when she collided with HMS Hawke. He would not be so lucky on the Titanic. Born in West Bromwich on September 11, 1879, John Wesley Woodward was the youngest son of Joseph and Martha Woodward. The family lived at 24 Hawkes Lane, Hill Top and his father was manager of the Hollowware Iron Foundry close by. John had several brothers, Joseph, Thomas, Frederick, Herbert, Samuel and Roland plus sisters Mary and Martha. By 1895 his father Joseph and brothers Joseph and Roland had all died. Sometime after this the remaining family moved to Oxford, settling in Headington. Brother Thomas went on to become a well-known tenor singer with Magdalen College Choir, Oxford. John became a professional musician playing the cello in Oxford followed by a time in the Duke of Devonshire’s band at Eastbourne. He later became attached to the White Star Line and made many journeys across the Atlantic and the Mediterranean on various liners. 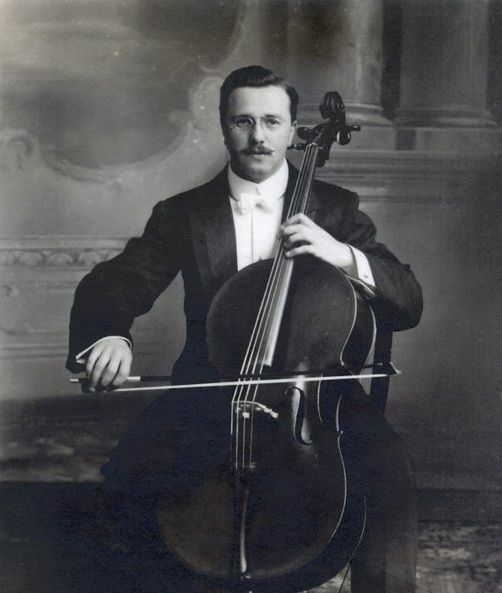 He embarked Titanic for her maiden voyage as a second class passenger at Southampton on Wednesday April 10, 1912 (ticket no 250654) Cabin no E and for the first time took his ’best’ cello with him. Five days later on April 15 the ship hit an iceberg and he and the other musicians famously continued to play as the Titanic sank. All members of the band drowned and the body of John Wesley Woodward was never recovered although his name is included on the family headstone in Heath Lane Cemetery where his father and brothers Joseph and Roland are buried. There is also a memorial tablet in the bandstand at Eastbourne and a brass plaque in All Saints Church, Headington, Oxford. The Titanic Band comprised of a quintet and a trio performing separately but on that last night they all played together in the hope of calming the passengers as the ship sank. None of the band members survived. Four other young men with a West Bromwich connection also perished in the Titanic disaster. Three sons of Richard Davies together with their Uncle James Lester had great plans to move to Pontiac, near Detroit. Two other brothers had already made the move which had proved so successful the whole family planned to join them. James Lester and his wife broke up their home to move in with the Davies family. James planned to leave his wife there and she would join him later. Alfred Davies aged 24 had married the day before they all set off and his wife was going to live with her mother until he sent money for her passage. Brothers John 21 and Samuel Davies 17 made up the group of four who all lived at 29 Harwood Street,West Bromwich. They booked their passages (third class) with Messrs. John Green & Son of Carters Green at the cost of £8. 1 shilling each. A mistake over train times meant the men were running late for their embarkation at Southampton but unfortunately they did manage to get there in time. Although his body was never found, his name was included on the family gravestone in Heath Lane Cemetery.